The first 30 seconds of a job interview often decide whether the recruiter thinks you are an interesting candidate or not. Presenting yourself in a confident, capable manner is the key to finding your dream job. This is why we invited Michelle Gropp from Lead with Words to hold a one-hour application training. She is a Canadian entrepreneur and Master Trainer who equips multinational organizations and their leaders across Asia to become outstanding communicators. Her company specializes in helping people increase their influence through how they present their ideas. She speaks 4 languages, has lived and worked in 7 countries, and has visited nearly 40 nations. Her unique background and close work with HR has given her an inside look into what top companies want in new recruits. Her workshop, titled How to Interview with Confidence, will help you to articulate your value to stand out from the crowd. There’ll be a Q&A at the end of the workshop. Note: The training fee is just RMB 50/person. Please keep in mind that the number of participants is limited to 50 people and the booking will be allocated according to the order of incoming registrations. Therefore we recommend signing up quickly to get one of the limited spaces. You will be perfectly prepared and motivated to talk to your dream employer. To even better prepare yourself for the Job Fair, please check out the information sheet below with important information regarding how to prepare your CV and motivation letter. Some open job positions will be posted on our WeChat account “GIC_China” so you can prepare individual cover letters before attending the Job Fair. If you arrange your application documents properly and attend the application training you are very well prepared for the Job Fair. Increase your chances to land a position at your dream employer! 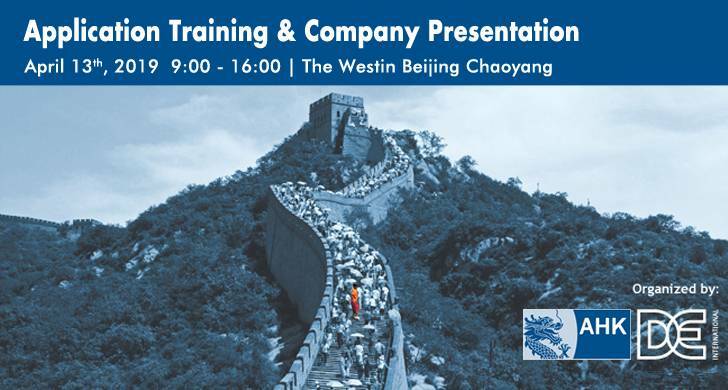 If you have any questions, please contact jobfair@bj.china.ahk.de, 010-65396637.